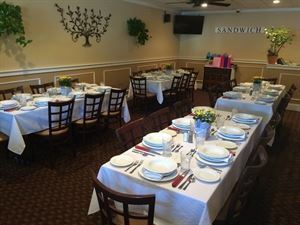 The Scorton Room at Marshland Too in Sandwich, MA is a perfect setting for holiday parties, business events, wedding and baby showers, and medium sized events. With seating for up to fifty people, Marshland offers fine food at an affordable price with a full bar and expansive buffet or plated dinner options. The package includes: Choice of: • Baked haddock with sherry crumbs, mashed potato and seasonal vegetable • Grilled salmon with over rice pilaf with seasonal vegetable and lemon caper butter sauce • Slow roasted statler chicken breast and white wine risotto with mushrooms • Butternut squash ravioli with spinach, roasted red peppers, sherry cream sauce and matchstick apples Please review our attachment for more options. The Package includes: Choice of: • Grilled swordfish nicoise with lemon vinaigrette, green beans, tomato and etc. • Grilled petite filet • Seared scallops with corn risotto, baby spinach and cherry tomatoes • Slow roasted statler chicken breast with herb jus, asparagus and white wine risotto • Butternut squash ravioli with spinach, roasted red peppers, sherry cream sauce and matchstick apples Please review our attachment for more options.